One usage and you will see exactly why people are willing prey for the Predator 228. 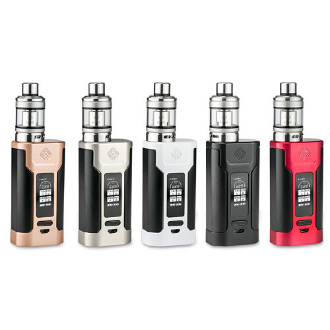 As stated in its title Wismec Predator 228 Mod can fire up to 228 watts. Powered by two 18650 batteries this device can hold a decent charge and also has a reverse charging adapter to act as a power bank for other electronic devices. The design of the Predator 228 is beyond glorious in shape and detail. The OLED display screen has a clear and thoroughly detailed interface. It has many control modes and support nickel, titanium, and stainless steel 316 wiring when in temperature control mode. The Mod has a "hidden" side button which keeps the entire device aesthetically pleasing while making the grip and use easier for vaping. This kit also features the Elabo Tank which has a super convenient slide top fill option. Both coils provided in the kit will provide you with large vapor and amazing true to name flavor!